Location. Lifestyle. A dynamic work environment. West Street offers compelling advantages as a business base. Already attracting corporate headquarters, professional services, and high-tech companies, this evolving corridor is at the heart of Annapolis, one of the East Coast’s most desirable communities. People live and work in a city shaped by its picturesque waterfront, long history, and rich cultural heritage. The atmosphere is relaxing, and opportunities for leisure pursuits abound, all just 35 minutes from the Washington-Baltimore metropolitan area’s exceptional array of government, business and technology centers. Modern highway, air, and rail systems offer easy access to the East Coast’s major cities. Baltimore/Washington International, Dulles International, and Reagan National airports link the city, nation, and world. The seat of state and county government, West Street is the gateway to a vital legislative center and a judicial hub. In addition to the State House and Arundel Center, new circuit and district courthouses and a significant number of new office buildings are clear evidence of the vitality of this professional and increasingly high-tech center. West Street is within walking distance of county and city services. The downtown advantage puts government, businesses, the City Dock and retail areas just minutes from a West Street address. Those who locate their offices along this corridor soon discover the synergy of West Street. Where businesses, residents, and city and county governments are working together to create a user-friendly downtown environment. A dynamic mix of commercial, professional, cultural and residential elements is emerging in an urban center bustling with activity from morning to night. 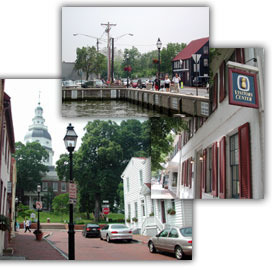 Once the site of colonial Annapolis’ city gate, West Street is today the entrance into the city’s Historic District, a lively and internationally acclaimed museum without walls and a maritime community hailed as America’s Sailing Capital. Bordering seventeen miles of waterfront, the city is graced by three centuries of architecture, vibrant neighborhoods, the U.S. Naval Academy, St. John’s College, Maryland Hall for the Creative Arts, and a host of other cultural attractions. The streets of Annapolis are meant for walking. Its buildings are of a comfortably human scale that creates an environment that attracts people who could live and work any place in the world..